Invisible Braces | Clear Braces In Colorado Springs | Matthew J. Burton, D.D.S. Clear aligners are a series of invisible, removable, and comfortable aligners. Invisible--Show off those pearly whites! 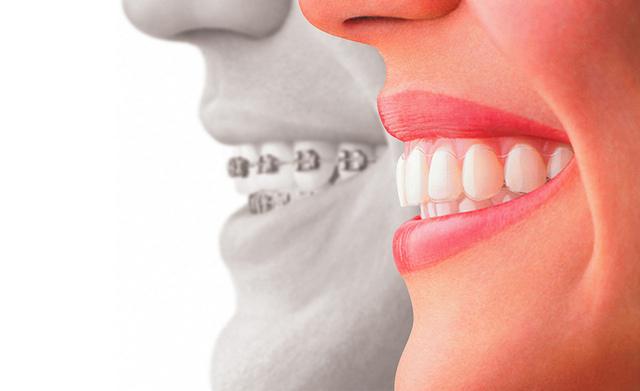 The aligners are transparent and much more discreet than traditional braces. Most people wont notice you are wearing them. Removable--It's easy to remove aligners. Unlike regular braces, you can eat and drink normally. Plus, no wires or brackets to catch food or get in the way when you floss. Effective--A great reason to smile. Get an excellent result with significantly less fuss! If you're a good candidate for clear aligners, we'll take impressions to capture the shape of your teeth and submit them to a specialized lab. They will then create a series of customized aligners to put pressure on the teeth you want to move. Each of these aligners is worn for two to three weeks, removing them only to eat, drink, brush, and floss. You meet with Dr Burton periodically throughout your treatment to check progress and start the next aligner in the series. As you replace each aligner your teeth will move day by day into their final positions. Everyone is different. Much like braces, it all depends on the complexity of your mouth and the results you want. This can range from just a few months to a few years. Average time spent in clear aligners is 15 months.